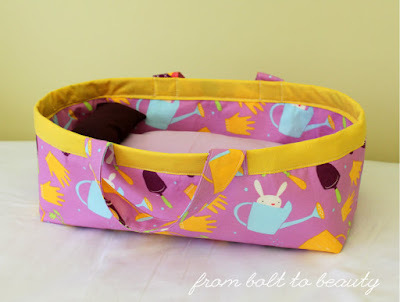 I completed this bassinet project well in time for Easter giving. There’s a canine roaming the halls of From Bolt to Beauty world headquarters. Her name is Rose, and she’s a high-energy golden retriever. She’s a lover, not a fighter, and if burglars broke into my house, the worst she could do is lick them to death. To my three-year-old niece, however, Rose is scary. Rose towers over this sweet little girl, and with every bark, my niece runs into my sister’s arms, pleading, “I need you!” The relationship between Rose and my niece affects every family visit, and that was the impetus for Operation: Like My Dog. Rose and my niece have come so far—I don’t want to lose any ground!—so when I saw the sweet bassinet Bernie (Needle and Foot) made for her granddaughter’s dolls, I started plotting my own for my niece from our dog. 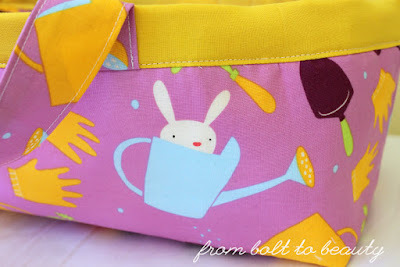 Because I didn’t know when I would have another occasion to use this fabric, I used as much as I could in this project—on the exterior, as the lining, and in a simple coordinating doll quilt. To make your own doll bassinet, visit the tutorial on Sew Mama Sew! If you have other ideas of what Rose can do for my niece—crafty projects and otherwise—please let me know in the comments. How ingenious! I would say Operation Rose is working! I have no further ideas, maybe chocolates shaped as paws? Does your niece have any age appropriate books about a Golden, whether fiction or real life story. Maybe where the dog is a hero? 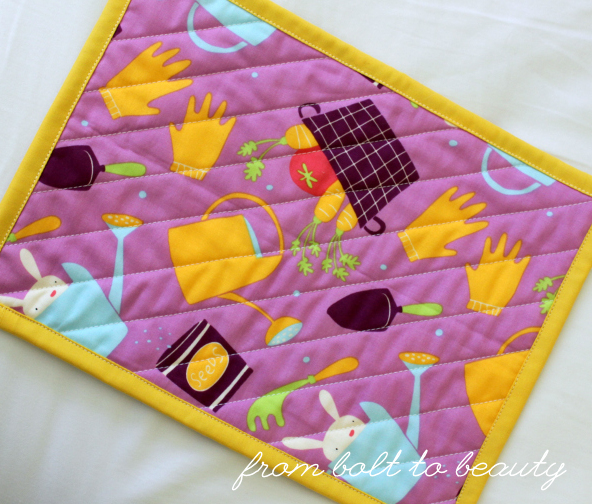 I made that bassinet a long time ago and it was not easy! Yours looks impeccable. So fun for a little girl or boy. I just found your linky party, thank you. Selfies (doggies?) from various places, like a park that your niece recognizes. 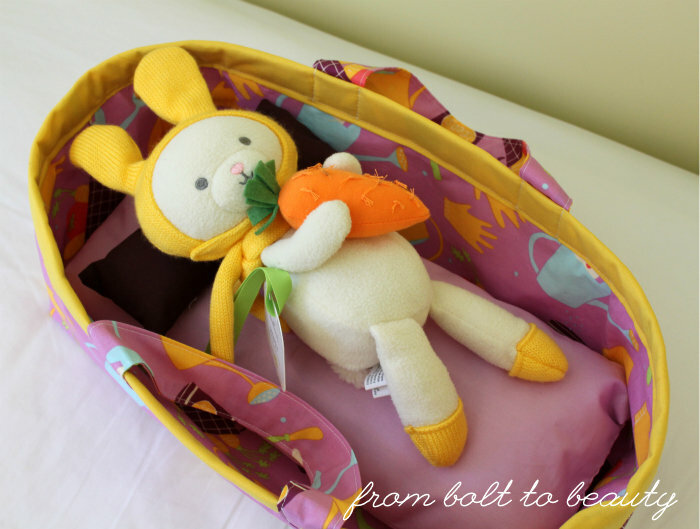 What a great story Michelle and a wonderful doll bed....more potential things to make for the little ones.